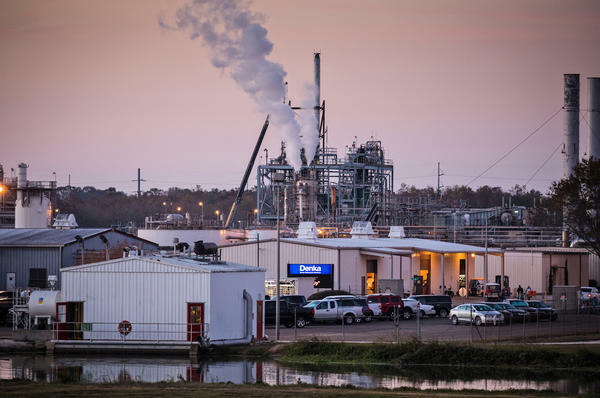 Each year, the federal government puts out tons of data about chemicals - data that most Americans never see or think about unless they live next to a chemical plant. NPR's Rebecca Hersher visited a town where a single number, published by the federal government, had profound consequences. REBECCA HERSHER, BYLINE: Laplace, La., north of New Orleans, south of Baton Rouge. Down here, the Mississippi River is wide and brown, and the air is warm and wet. Food 4 Less, T-Mobile, Cash America Pawn, big Walmart. You know, it looks like anywhere. But to Bobby Taylor, it's the most important town in the world. He's lived here for 77 years. BOBBY TAYLOR: I was born here and raised here. My children were born here. My grandchildren and my great-grandchildren, we were all born - this is ours. HERSHER: There are two other notable things about Laplace. The first is that there's a factory in town. It's been here since 1969, and it's the only factory in the U.S. that makes neoprene, the rubbery material in wetsuits, yoga pants, computer sleeves. And all of that leads us to the other thing about this area, its nickname cancer alley. TAYLOR: My mother succumbed to bone cancer. My brother had lung cancer. My sister, I think it was cervical cancer. My nephew, lung cancer. HERSHER: Taylor's whole adult life, he's wondered if the neoprene plant had something to do with all the people he loved getting sick. He'd talked to neighbors about it sometimes. Like, maybe we should try to confront the company that owns this place, which, for years, was the chemical giant DuPont. Most people thought that was not a good idea. TAYLOR: Said, what's wrong with y'all? Y'all trying to fight DuPont? Y'all crazy? You can't win fighting DuPont. WILMA SUBRA: EPA called and said, OK, we need to talk about chloroprene. HERSHER: Wilma Subra is a chemist at the Louisiana Environmental Action Network. Unbeknownst to Taylor, she had been pushing the Environmental Protection Agency to study the hazards of chloroprene. And for years, they'd been doing just that through a program called IRIS, which is the EPA's gold standard for assessing chemical risk. SUBRA: Yeah. I had dealt with the IRIS program for many decades and years because they can develop a standard based on all the latest scientific evidence. They have the best process. HERSHER: That process is really labor-intensive. For a single chemical, dozens of scientists spend years analyzing and arguing and reanalyzing draft after draft of their findings. Lots of people weigh in from other government agencies, from industry. In one case, it took IRIS 25 years to finish analyzing one chemical. At the end of all that work, IRIS produces a single number, the amount of the chemical that's safe for humans. For chloroprene, the IRIS number was 0.2 micrograms per cubic meter. So what was your immediate reaction when you heard about this number? SUBRA: That's a good number. That's a really good number to protect the community. HERSHER: Zero-point-two micrograms per cubic meter. All of a sudden, Bobby Taylor had concrete information. Air monitors in town showed levels 10, 50, sometimes more than a hundred times that amount of chloroprene in his neighborhood. Taylor founded a group called Concerned Citizens of St. John the Baptist Parish. Zero-point-two became their rallying cry. TAYLOR: I got a whole case of these shirts somewhere. HERSHER: He even printed T-shirts. So what does it say on the front? Only .2 will do. TAYLOR: Yeah. In the plant, they didn't like that, boy (ph). They talked about the people in them red shirts out there. HERSHER: They wear the 0.2 shirts to county meetings, to picket outside the plant. 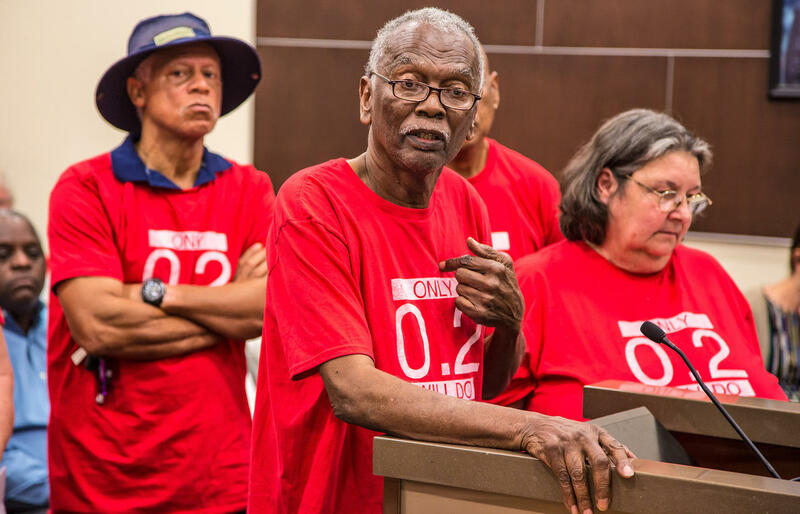 And Taylor is part of a lawsuit asking the state to shut down the plant until it can get chloroprene levels down to 0.2, but not everyone is happy with the 0.2 guideline. The company twice petitioned the EPA to change it. The EPA said no, and there's a bigger fight playing out. A lot of people think the whole IRIS program, the program that came up with that number, should be dismantled. All that money and time spent analyzing and checking, years of waiting in work for one number, IRIS has become a poster child for ineffective government bureaucracy. HERSHER: That's Arizona Republican Andy Biggs at 1 of at least 5 congressional hearings about IRIS. During the Obama administration, there was a push to overhaul IRIS. Now, in the Trump era, some are pushing to kill the program altogether. Biggs argues the whole IRIS process is more confusing than helpful. BIGGS: If that is indeed the case, IRIS poses a threat to the public's trust and safety and simply cannot be allowed to continue to operate. HERSHER: But Bobby Taylor sees it differently. That 0.2 number from IRIS is his only source of power. TAYLOR: It's the ability to determine your own destiny, to have some input, you know, to say, yeah, I'm going to build something that I'm going to leave for my children. HERSHER: The EPA is expected to consider changes to the IRIS program in the coming months. Rebecca Hersher, NPR News. Transcript provided by NPR, Copyright NPR.